Epithet means "having sharp points." description: The rhizome is erect, bearing vases of firm, dark green, arching fronds. At barely one-sixth the length of the frond, the stipes are significantly short, but fat and heavily dressed in translucent russet scales. The lanceolate, bipinnate blade tapers strongly at the base with lower pinnae less than 1 in. (2.5 cm) long. The 25 to 35 pairs of pinnae are pointed with spine-tipped pinnules that are hard and slightly prickly to the touch. The sori stitch the pinnules and have peltate indusia. 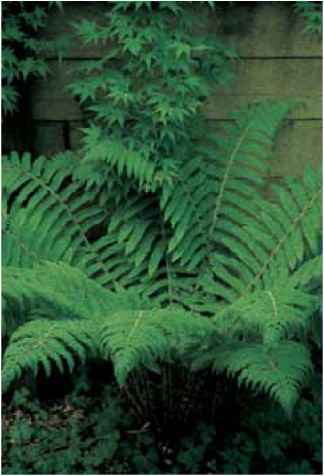 range and habitat: In nature, Polystichum aculeatum prefers moist, lime-rich soils and can be found in shaded glens, ravines, and seeps in Britain, Europe, North Africa, and east to Turkey and the Caucasus. culture and comments: This is a truly handsome addition to the garden, but for optimal display appreciates a basic compost. I have mine adjacent to a concrete foundation in the belief that slightly leaching lime will keep it in good humor. It will adjust to neutral soil, however, so long as Mother Nature or the hose handlers tend to its moisture requirements. Two summers of drought reduced my parent plant from a splendid 30-in. (75-cm) display to a 15-in. (38-cm) survivor of sorts. It can be confused with Polystichum setiferum, its fellow Brit and continental associate. 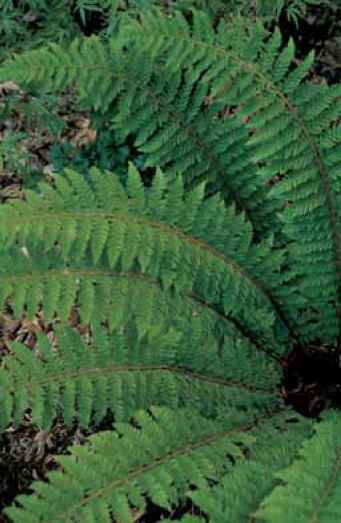 common names come to the rescue here as P. setiferum is the "soft shield fern" and, at the risk of annoying your garden hosts, can be distinguished by the soft "feel" of the latter versus the hard of P. aculeatum. More scientifically, the stipes on P. setiferum are proportionately longer in relation to the blade, and the lower pinnae are closer in size to those of the midsection. cultivars previously assigned to this species have been transferred to P. setiferum. There are, however, some contemporary diversions including an extremely attractive crested 'Cristatum' from Germany and an elegant plumose selection 'Zillertal'. In addition P. aculeatum hybridizes with P. lonchitis forming the sterile intermediate P. xillyricum (see description). Low arches of firm "hard" fronds of Polystichum aculeatum.